Although we have lived in D.C. for a while, we have very few “go-to” spots. The restaurant that tops our list is D.C. Coast. On its face, D.C. Coast doesn’t seem like it would be a strong contender for the top “go-to” for a vegetarian couple that (self-delusionally) views itself as (kind of) young and (kind of) hip. It is a seafood restaurant that has been around a while and caters largely to the downtown lunch crowd. The key is D.C. Coast’s ingenious reverse happy hour. Beginning at 9:30pm, D.C. Coast serves cocktails (including delicious martinis and mules), wine, and beer at a heavy discount at the bar. The drinks are tremendous, accompanied with the great service and witty repartee of the always delightful bartenders. D.C. Coast typically has a few vegetarian options on the menu, along with two off-menu items. The restaurant always offers a chef’s choice vegetarian pasta and a vegetable plate consisting of a selection of seasonal sides. And save room for the souffle, which changes on a daily basis. It may not be the most innovative or exciting restaurant, but D.C. Coast’s strength is that the drinks, food, and service are always reliably superb – and what makes it the perfect go-to spot. A Saturday night, the restaurant was packed with groups of young, attractive D.C-ers (J: I don’t think that’s a word. K: Even Shakespeare made up words. Just go with it. J: You ain’t no Shakespeare…). If it were merely the drinks, people watching, and ambience, the Fainting Goat would have been a pretty good spot. That said, the Fainting Goat fell short. Its always a bit disappointing when a hot new restaurant doesn’t deliver. And with the availability of interesting ingredients, influences, and techniques, it is even more disappointing when it is the menu itself, not merely execution. Such was the case at the Fainting Goat. We started with the ricotta toast points, which were reminiscent of the tea sandwiches inevitably served at those interminably baby showers (J: I also don’t think you can say that without alienating people. We officially lost our two readers. Thanks Moms.). A ricotta not all that distinguishable from cream cheese on sliced bread. Moving on to dinner, there was not a single vegetarian item on the menu. The waiter offered to have the chef put together a dish, which consisted of a quarter plate of plain, boiled vegetables. For 20 bucks a plate. The fault is as much ours as it is the restaurant’s. We are the ones with the dietary restrictions, eating at a restaurant that doesn’t cater to our kind. That said, we are just left with the feeling that there were so many simple ways to have done…better. K: This post is about the only worthwhile reason to have a car in DC. J: Visiting my parents in Richmond? K: (Seeming flustered) Um, yeah, sure – that too…but no one wants to read about that (nice save). It is Yechon, the 24-7 Korean BBQ joint in Annandale. The only thing that shines brighter than the neon lights lining the entire restaurant is my smile after eating there. Although the centerpiece of its lengthy menu are barbecue and noodle dishes featuring meat and fish, Yechon’s few vegetarian dishes are soothing, almost heartening. An off-menu request, the vegetable bibimbap in the hot stone bowl with tofu is sublime, particularly on a cold winter night. The hot stone bowl perfectly toasts the rice and cooks the veggies; mixed together with Yechon’s hot sauce, the dish is the ultimate comfort food. Add to dinner a variety of veggie-friendly accompaniments – including the delicious kimchi – a large bottle of beer to be shared, and friendly servers that remind us a whole lot of mom (if she were Korean), the whole experience is, well, soul-affirming. J: Do you know how I knew Sona was going to be really good? J: It smelled pretty funky. Good cheese always smells pretty funky. K: Remember the Limburger cheese incident from college? I don’t remember much from 15 years ago, but that memory is crystal clear. You said if it smelled that funky, it had to taste good. Not so. It smelled terrible and tasted worse. To top it off, my dorm room smelled like Lindberger cheese for months after – ack. J: No, your dorm room smelled like a corpse. 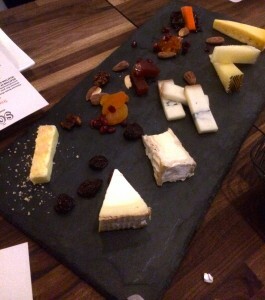 I didn’t learn much that semester (sorry Mom and Dad) but I did learn that not all funky smelling cheese tastes good. However, all good cheese smells funky. Let’s call that a life lesson. At any rate, Sona smelled delightfully of good cheese. K: True that. By the way, sometimes you smell like Limburger. But Sona is so much more than a cheese shop. Instead, it is a perfect urban picnic (J: And no blanket necessary). Lots of options of small plates of little bites. Full of flavor, perfect for leisurely grazing, either for a group or a romantic pair (J: Romance does not have to be limited to a pair. K is such a hater.). That said, a few more vegetarian options would be a welcome addition. Friends selected the wine – a Vouvray and a Cotes du Rhone – both of which were very reasonably priced and paired delightfully with the cheese. Although Sona is new to the neighborhood it already feels quintisentially Capitol Hill and that is a function of the wonderful owners and staff. Stage setting: Long week. Edit: Couple very long weeks. Mid-week, a little break. Where to go? Comfort food. J says veggie burgers. K says martinis (after all, do we really need food?). The compromise? Smoke and barrel, the perfect combination of bar (for K) and bar food (for J). The spin? Very pro-veggie food, particularly for a bar – veggie wings, veggie chili nachos, veggie ribs, and lots of veggie-friendly sides. The buffalo wings were satisfying, albeit a little bit chewy. The buffalo wings are made of texturized soy (the ribs are made of seitan) and there are lots of options on rubs and sauces. Most importantly, it is rare for vegetarians to experience the sublime pleasure of “meat” on a stick. On this, Smoke and Barrel was right on target. The second course of our bar dinner consisted of veggie chili nachos. The heaping nachos – the sheer size of which was so large, we only made it through about a quarter of the plate – were yummy and gooey with all of the fixings. Smoke and Barrel also offers an array of good beers to wash it all down. J: OMG. I can’t believe I ate “satan” on the first day of lent. K: It is seitan, not satan. J : Nevertheless, I need holy water! K (as she passes her beer over to J): Here you go. Recently re-opened, the Iron Gate has two seating options. First come, first serve at the somewhat covered carriage house which houses a bar and a handful of tables, or tasting menu in the dining room. Unable to get a convenient reservation (and dying to try it out), we settled for the carriage house. So, how does a restaurant that is effectively outside manage to be “completely committed” with an hour wait when it is below freezing? Even though the temperature outside was ghastly frigid, Iron Gate radiated warmth (not insignificantly due to the generous use of heating elements), comfort, and sophistication. We waited for a table while enjoying the ambience of the lovely bar and the delightful cocktails. If it were just the two of us, we probably would have chosen to eat there. Wine, a 2006 barolo per the recommendation of the manager, was probably one of the best bottles we’ve had in some time. Our dinner order was literally “everything vegetarian on the menu.” Which turned out to be quite a lot. Focaccia, trio of dips, trio of cheeses, trio of olives (haha – a trio of trios! ), crispy Jerusalem artichokes, winter root vegetable salad, farro salad, and pasta. The flavors and ingredients played off of each other deliciously – the food at once combined the lightness of the Mediterranean, with ingredients that felt appropriately wintery. The one non-vegetarian in our foursome enjoyed partaking in our offerings, while also taking great pleasure in his non-veggie entrée. For recently being named the Best New Restaurant by Washington City Paper, Table was refreshingly…unfussy. A small number of tables, no big crowds (at least the weekday evening we were there), and low-key and helpful staff gives Table the feel of a favorite neighborhood spot. At the same time, the backdrop almost fade away, providing a platform to elevate the food and wine, the freshness of the ingredients and the careful, but not overly contrived, engineering of flavor combinations. We started with two appetizers, a beet salad and a mushroom toast. The modest portions forced you to focus on the ingredients and how well they played off each other. (J: “Modest” = not enough on my plate.) For dinner, we had the root vegetable bowl, with consisted of various roasted vegetables in winter squash accented with purple mustard. (J: Still hungry.) The wine – a pinot noir and burgundy, both recommended by the waiter – heightened the flavors. Simple, yet thoughtful. So, for vegetarians that like a lot of options or heartier fare, a cautionary note is that there were only couple of veggie-friendly appetizers and one entrée (which also should be noted was entirely vegetable based, without any starch or protein). Granted, Table does host Meatless Mondays, which we look forward to trying. There were a lot of options for non-vegetarians and our dinner companions, who generally keep to a pescetarian diet when eating out, enjoyed their (much more generously-sized) entrees tremendously.